A relatively harmless comedy about a group of slacker community college students roped into joining a LARPing tournament in order to save their grades. For better or worse, taking potshots at the Live Action Role Playing crowd is playing with a pretty low net, and one doesn’t feel any real affection for its participants from director Peterson and co-writer Andrew Herman depictions. 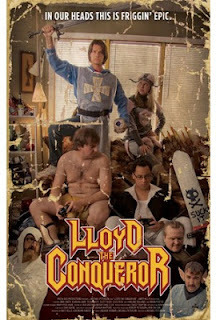 Not to say there aren’t some humorous moments and interactions (Brian Posehn, as the sage white wizard Andy, has some choice deadpan moments) but Lloyd doesn’t seem to respect its subject or offer any real insight into this immersive alternate universe (like say, Role Models or The Wild Hunt). It’s just a punchline, a vehicle for goofy laffs.